Besides, if you want to refer to my last pub Bakara , I never mentioned " Barbancourt " . The art is very difficult to understand, especially when you're not ready . In addition , it is clear that we are in the presence of a false debate. In your article, you have misled your stakeholders. From this observation, I am entitled to ask me some questions: A " Director of opinion " of the caliber of Roberson Alphonse is it not able to assess and judge a work of art on its own merits ? 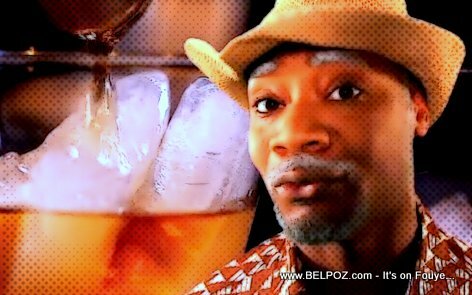 The character Tonton Bicha is he has no right to represent a rum called " Bakara " ? Do not I have the right to advertise for a company that appreciates their fair values my talents? In doing so , I committed a designated offense punishable by Haitian criminal law ? First, I must confess that I accepted to monetize my talents by making available to the said rum because I think it is good . And especially because of his constant presence through various cultural activities such as fiestas , the rara carnival , our various festivals , sports, etc. In the light of these considerations, could we not say that this is the real Haitian cultural rum ? Despite his young age, he was able to attract the sympathy of a large number of consumers . My friend Alphonse , in your article , interviewees commented from false data . Since at any point in time I had to cite " Barbancourt " or to undertake a smear campaign against this product. Even when I would mention , it would not be a mortal sin. We want to show the competition between Pepsi and Coke. For cons , I would not do under any circumstances in a country where the culture of tolerance is lacking. There is no need to remind you that when the data is incorrect, the results will always be wrong. Some of your players who set themselves up as defenders of national production does not even have the courage to use a local pipe , or rather "made in Haiti " . What hypocrisy ! How these intellectuals can they get caught in this trap? If I'm not mistaken , I think the authorities cry all day long "Haiti is open for business ." This behavior is not it likely to discourage potential investors Haitian or foreign ? Brother Roberson , what is the economy of such an approach ? There can be no development without competition. Let me remind you that I am an advertising have been honored more than a dozen times . So I control my job very well , and my millions of fans can attest. If any competitor feels threatened by soaring Bakara , it improves the quality of its product and then find a good advertising . My dear Roberson Alphonse , you are greatly mistaken about me , and I forgive you , brother. A final reminder : Article 313 of the Haitian Penal Code states: " To be guilty of defamation , who , whether in public places or meetings , or in an authentic and public act, or in writing to be printed or not been displayed, sold , or distributed, will be attributed to any individual facts that undermine his honor and consideration . " Do not worry , I will not ask you to show me a public apology. But the most amazing thing is not that behind acts of bravado , but he recognizes that have caused harm to others . It is man only insofar as it is able to feel the rhythm of this dimension. Read the French version of the article here. What do you think about what Tonton Bicha had to say? oui ou gen talent ou original nan sa wap fe a sevre, men toujou konen COULEUR LOCAL AK PRODUIT LOCAL SE IMAJ NOU. leur fe sa a a, ou bay voisin a cote a rezon poul pa ni ede w vanse nan production pa w la, men ou bal tou yon lot rezon poul pa gade couleur local nou an pou anyen. I Like this! The words of an Artist. Why didn't anyone tell me TonTon Bicha's name is Daniel Fils-Aime? I learned so much through this response. I understand both sides of this, I'm in favor of competition to boost quality and price.